1998's Yield is not only my favorite Pearl Jam album, it also signifies the rebirth of the band. They were a commercial phenomenon for their first three albums - Ten, Vs., and Vitalogy - and their commercial success waned during their "experimental" era of Vitalogy and No Code. However, commercialism often does not equate when it comes to crafting art. In the making of Yield documentary Single Video Theory, there was a sentiment that the band had become a true collaborative force recording the Yield album. Everyone contributed to the songwriting process in one way or another, whether co-writing with another band member or bringing a song to the table. Live on Two Legs finishes the Yield era trilogy (Yield, Single Video Theory, and Live on Two Legs) by documenting how the band performed during their 1998 tour. It's not a true concert but a compilation similar to the DVD Touring Band 2000. 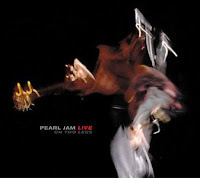 Also of note is that this live album shows the reborn band still in transition, with former Soundgarden drummer Matt Cameron behind the kit, replacing the semi-retiring Jack Irons. All in all, it's a solid live compilation, with the debut of the song "Untitled," which often transitions into "MFC." 2000/1: Binaural, Official Bootleg Series, and Touring Band 2000. 2002/3: Riot Act, Official Bootleg Series, and Live at the Garden/Live at the Showbox. 2006/7: Pearl Jam, Official Bootleg Series/Live at the Gorge 05/06, and Immagine in Cornice. Obviously there's some clever marketing afoot in releasing album era trilogies, but it does beat releasing and reissuing the same album seven or more times (Zeitgeist).